Capturing video of walking through a crowd isn’t easy with a conventional camera. GoPro changes that situation, thanks to its small dimensions and wide view. You have lots of ways to move through a crowd with a GoPro attached to a headband or chest mount. Head Strap plus Clip: The GoPro is almost small enough that you can walk through a crowd with it unnoticed. Try mounting the camera on your headband and looking behind you. This technique can provide some funny, compelling footage, especially when people get too close to you. You can monitor the scene by watching it on your smartphone. Chesty (chest harness): Also known as the Chesty, this mount holds your GoPro at chest height, providing a slightly different perspective. Wristband or Strap: Both mounts let you grab shots to the side and shoot from the hip by holding the camera low and directly in your path. This technique helps you create some unique GoPro imagery. 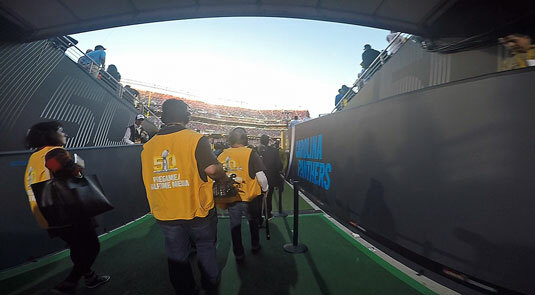 Walking onto the field for the big game provides an interesting perspective.